It’s common knowledge that natural Australian attractions such as Uluru and the Great Barrier Reef are popular with visitors from China. But there’s another hotspot that our Asian neighbours are making a bee-line for that you may not have heard of – yet. Incongruous though it may sound, Victoria’s Lake Tyrrell, a 20,860-hectare pristine salt lake, has proved a massive hit in the past few years with tourists from China, primarily thanks to photos posted on social media that have gone viral; with some Chinese tourism websites now naming the site as a key Australian tourist destination. To pump up those visitor numbers even further, as well as simultaneously improving safety and preventing unintentional damage to the natural environment, a $2.58 million development, funded by the Victorian Government, will include a boardwalk, signage, walking tracks, a viewing area, waste management facilities and a parking area. The spectacular salt lake is located in the Mallee wheat belt, about a four-hour drive up the Calder Highway north-west of Melbourne towards Mildura. In dollar value, when completed in mid-2019, the development is tipped to bring $6.9 million into the local economy. Those projections are particularly timely for residents in Sea Lake, a town about seven kilometres south of the lake with a population under 1000, whose traditional reliance on grain production, is now on track to experience a fiscal lift through tourism. Interest has also been tabled with the State Government for lake tours and non-nature based activities such as hovercraft rides and helicopter tours. One business already setting that ball in motion is Promhelis, a newly-established helicopter scenic flight business operating out of Sea Lake. Why has Lake Tyrrell developed a cult photography following? What’s the allure? Lake Tyrrell sometimes delivers an optical illusion of walking on water. Crowds tend to gather at sunrise, sunset and on clear nights. 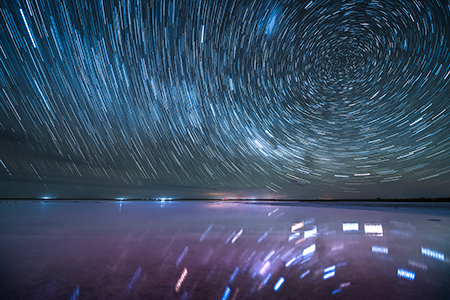 The vast expanse of lake bed and often little cloud also make it a popular destination for star gazing – even just a few minutes from the lake, you can’t experience the same amazing night sky. During wet and warm periods, the lake turns pink from red pigment secreted by pink micro-algae red marine phytoplankton, presenting yet another one-of-a-kind photo opportunity. Tyrrell is derived from the local Aboriginal word ‘direl’ which means space. Tyrrell was the name of the first white settlers’ land holdings: Tyrrell Downs and Tyrrell South Stations. Photo credit: Photos published in this article were taken by Anne Morley.